ADI has emptied the last circus of its wild animals in Peru as part of a record-breaking rescue mission, concluding a collaborative effort with the Peruvian Government to enforce their ban on wild animal acts, passed in 2012 after an investigation and public campaign by ADI. 30 lions and 9 monkeys rescued during the Operation Spirit of Freedom mission are being cared for by ADI at our temporary rescue centre near Lima, until they can be relocated to their permanent homes. 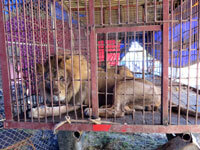 Having spent months tracking down the circuses and planning with Peru Government officials, Operation Spirit of Freedom began in earnest in August when the ADI rescue team and the authorities removed 12 lions and a spider monkey from circuses in Huaral, Ayacucho and Cuzco. One of the male lions, Smith, made headlines around the world after attacking a teacher during a performance. The circus had previously refused to surrender Smith to the rescue team and irresponsibly forced him to continue performing. As public pressure to kill Smith mounted, ADI raced back across the Andes to plea for his life and succeeded in bringing Smith and two cubs, who had been separated from their mother, back to the rescue centre. Last week the last animal circus voluntarily handed over its two lions, David and Rapunzel, and announced that it is to become a completely animal-free show. Although these are believed to be the last wild animals in Peru’s circuses, ADI has asked the public to be vigilant, keep on the lookout for wild animals in circuses and report any circuses defying the ban to ADI. The ADI team also picked up six more lions from Lima and Hauncayo zoos, which had already been removed from circuses by the authorities – bringing the total number of lions in the ADI Peru centre to 21. ADI has also assisted the Government of Peru by providing temporary accommodation for monkeys and other animals seized from the illegal wildlife trade. 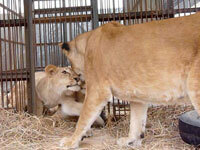 ADI will build homes at sanctuaries in Peru and transport the animals to their new homes in the midst of the Amazon. As part of ADI’s Operation Spirit of Freedom nine lions have also been rescued from a circus in Colombia – following the wild animal circus ban being passed there – and will be joining the 21 Peruvian lions on a record-breaking flight. The ban on wild animals in circuses in Peru was secured after a five-year campaign by ADI and local animal protection groups, following our shocking two year investigation of South American circuses. ADI investigators exposed the violent and brutal treatment that the animals were subjected to whilst being handled and trained, as well as the deprived circus environments they endured. ADI’s evidence shocked the continent and legislation to prohibit wild or all animal acts was subsequently passed in Bolivia, Colombia, Ecuador and Paraguay, in addition to Peru. Operation Spirit of Freedom follows a similar historic rescue mission in Bolivia, charted in the award-winning action-adventure documentary Lion Ark, and which recently signed a worldwide distribution deal for television, video on demand, DVD/Blu Ray, and in-flight entertainment with ITV Studios Global Entertainment. ADI has driven forward the call for British legislation to end the use of wild animals in circuses with exposés of cruelty which resulted in convictions of circus owners Mary Chipperfield and Roger Cawley and, more recently, Bobby Roberts for the suffering of Anne the elephant. The cases were pivotal in educating the public and persuading the British Government to ban wild animals in circuses. A private members bill will go before Parliament again this month and ADI have repeatedly said they are prepared to rehome any ex-circus animals if a UK law is passed. Operation Spirit of Freedom is being funded by ADI supporters, including a significant donation from legendary US TV ‘Price is Right’ game show host Bob Barker.